Boeing [NYSE:BA] and the Lion Air Group today announced a commitment for 50 737 MAX 10 airplanes at the 2017 Paris Air Show. LE BOURGET, France, June 19, 2017 /PRNewswire/ -- Boeing [NYSE:BA] and the Lion Air Group today announced a commitment for 50 737 MAX 10 airplanes at the 2017 Paris Air Show. The announcement, valued at approximately $6.24 billion at list prices, will be posted to the Boeing Orders & Deliveries website once finalized. "The 737 MAX family of airplanes is the perfect combination of single-aisle aircraft for the Lion Air Group, with their new level fuel-efficiency as well as range and capacity capabilities," said Lion Air Group President Edward Sirait. "The Lion Air Group was first in the world to put the 737 MAX 8 into service and the first to order the 737 MAX 9, and we continue to lead the way again with this commitment for 50 737 MAX 10s and help launch the latest version of the 737." The Lion Air Group is one of the world's largest Next-Generation 737 operators and previously ordered 201 MAXs. The airline is also the launch customer of the 737 MAX 9 and its subsidiary, Malaysia-based Malindo Air was the first airline to take delivery and operate the 737 MAX 8 in commercial service. 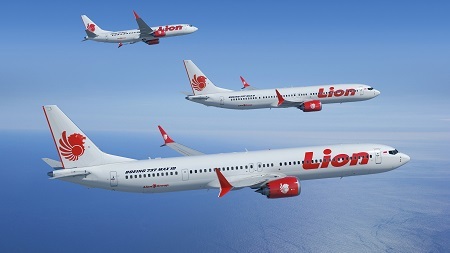 "Boeing is honored that the 737 family of airplanes continues to play an integral role in the Lion Air Group's fleet and growth strategy," said Boeing Commercial Airplanes President and CEO Kevin McAllister. "This commitment is a testament to the capabilities of the 737 MAX family of airplanes and we look forward to delivering both the 737 MAX 9 and MAX 10 to them in the coming years." The 737 MAX 10 will be the most profitable single-aisle airplane, offering the lowest seat costs ever. The entire 737 MAX family has been designed to offer customers exceptional performance, flexibility and efficiency, with lower per-seat costs and an extended range that will open up new destinations in the single-aisle market. Like Boeing's other 737 MAX models, the MAX 10 incorporates the latest technology CFM International LEAP-1B engines, Advanced Technology winglets, Boeing Sky Interior, large flight deck displays, and other improvements to deliver the highest efficiency, reliability and passenger comfort in the single-aisle market.